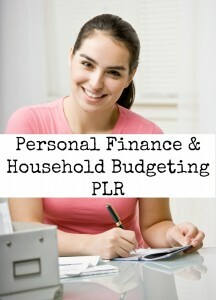 Are you looking for quality personal finance/budgeting content to add to your blog or website? Do you talk about saving money and creating a household budget? Then this PLR Bundle is for you. If you want to help your readers create a household budget and starting saving, you can get this incredibly value-packed bundle for FREE. Simply Register Below and receive an immediate download. That's a total of 5 articles FREE (400+ words each) Give your readers the content they are looking for! Like what you see? Check out our other PLR Bundles.